Despite my best efforts my fridge is not always perfectly stocked. Ideally, I try to always have a good supply of greens, raw veggies, fruit and staples such as lemon juice and almond butter on hand. In reality a busy week and no time to get to Whole Foods sometimes leaves my fridge lacking. This has been happening a bit more recently. As I get bigger and more tired a trip to the store sometimes feels like just too much to handle. Putting my feet up and reading is much more appealing! There are many days when I peek inside, ready for a snack, only to find random fruits and vegetables such as one avocado, a red pepper, some pomegranate seeds and a bit of lemon juice. Not quite the perfect lineup for my favorite Pomegranate Guacamole. Well, as they (who they are I don't know) say necessity is the mother of invention. When an eight month pregnant lady wants a healthy snack, sometimes she just has to invent one! This Spicy Sweet Express Guacamole is super fast to make and cannot be messed up. If you don't have pomegranate seeds you could add some other diced fruit such as pineapple or just omit the fruit altogether. If you are not a spice junky like me feel free to leave out the hot sauce. It will still taste just as good! Hey, even just an avocado mashed up with lemon juice and sea salt is a delicious and incredibly good for you snack! Recently I have been enjoying this guacamole inside of red pepper halves but it also works great as a dip for carrots, celery, romaine leaves or any other other raw vegetable you may have on hand. After all this is snacking and should not be taken too seriously! In a small bowl mash together the avocado, lemon juice, sirarcha, sea salt and liquid stevia until smooth. Gently fold in the pomegranate seeds. 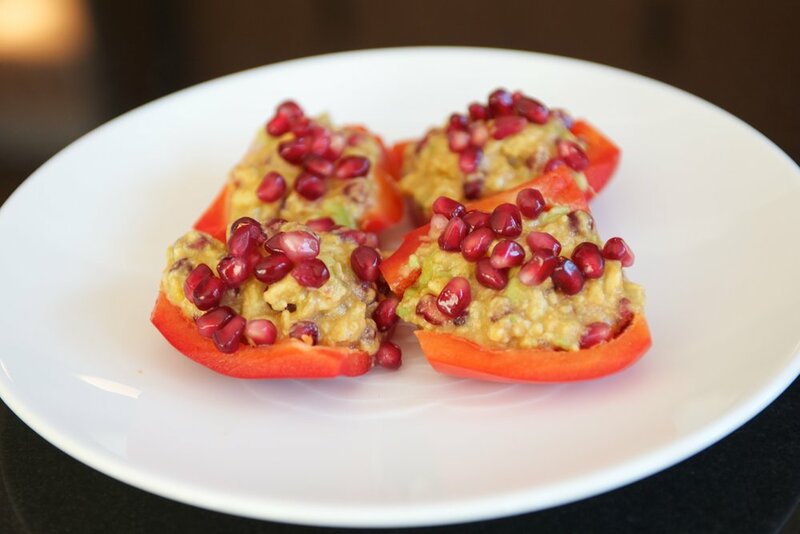 Serve inside red pepper halves or as a dip for raw vegetables.